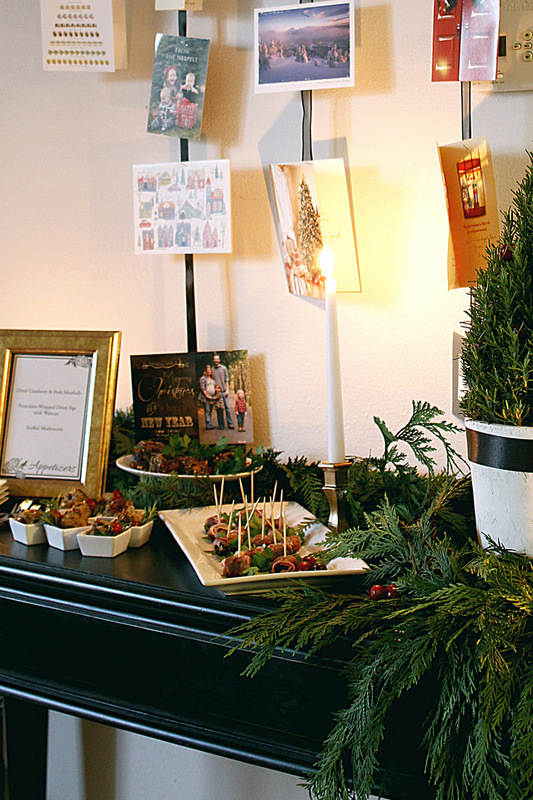 Recipe #2 from our festive natural greenery holiday party, DIYs, and Paleo-friendly recipes! 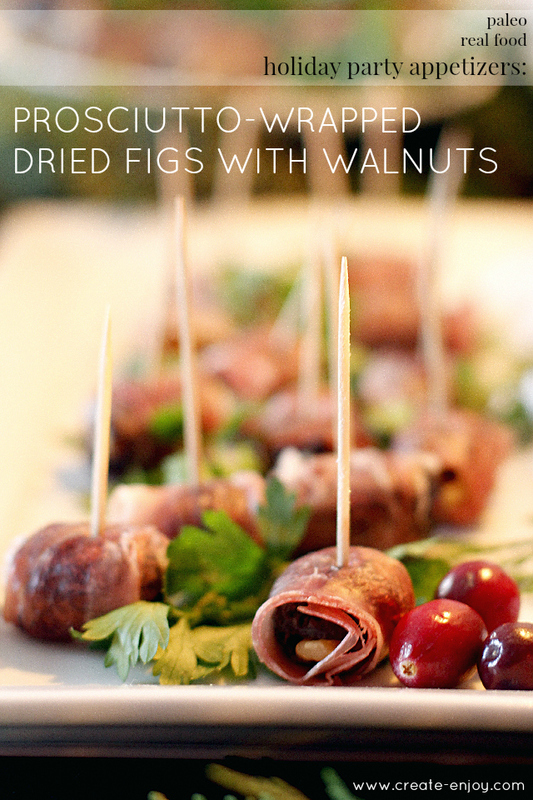 A simple and fun prosciutto-wrapped dried fig, stuffed with walnut pieces. The bacon-wrapped date is a party classic and favorite, but I wanted to try something a little different. I'm very new to fancy meat appetizers, but dried fruits do seem to usually go well with cured pork, right? And I wanted to use figs, although they're not fresh anymore so dried is the best I had. I see a lot of dried fruit/meat appetizers with cheese or goat cheese, but I don't do dairy most of the time so I wanted to do something tasty and interesting that was also dairy-free. I buy dried figs and walnuts in the bulk foods section of the grocery store, and this was actually the first time I've ever bought prosciutto--one package was more than enough for plenty of these treats, so it's not too expensive, either. Here they are as listed in our holiday party shoot, with a few other appetizers (including these dried cranberry/pork meatballs and another one I'll post about soon!). Cut stems off figs and make incision into fig from cut end. Push walnut halves or quarters (my figs were small so I used quarters) into figs. Wrap each fig in small slice of prosciutto and poke a toothpick all the way through. Serve cold if you don't cook them, and serve immediately after frying or baking if you do. You could also try it with pecans or other nuts if they are local to you! This sounds so yummy. I love the idea of the mix of sweat figs with something salty. Any ideas on what would work instead of prosciutto? I dont eat pork. What a unique twist to a classic party appetizer! I haven't had dried figs before, so I'll have to check it out. Thanks for the recipe! Fun idea for an appetizer! This looks like a perfectly simple and delicious app! I do a similar appetizer that includes a gorgonzola filling. It really is wonderful, all that sweet and savory mixing together into one lovely little bite of delicious. And so easy to put together too. We ordered our cards from Minted last year, and they turned out amazing -but now I feel a little pressured to outdo ourselves this year :) Although, this year we do have two new additions to our family (twins), so our cards will definitely be a lot cuter no matter what. Those are gorgeous! We used Minted for our Save the Dates and I loved them! Love the cards - I may be too late / lazy to put together holiday cards, but may have to check out Minted for our 2015 mailings! Oh how I adore their wrapping paper! I love the Hap-Happiest Christmas card the most! The photo shoot turned out so pretty. I love the sprays of pine around the serving dish. I love their stuff. I'll be needing birth announcements soon. Hope I win! You can always do New Year's cards! Aren't those foil prints gorgeous?! Hmm, I don't know, when I was vegetarian and vegan I just ate plain figs! Or dipped in salty almond butter for a snack. ;) I see a lot of recipes that pair them with pork. They are good in salads, too, and you could do goat cheese and salted nuts or something on top.